The balance of Payments (BoP) and Balance of Trade (BoT) are two confusing concepts for even economics graduates. 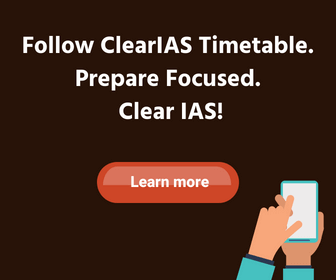 These terms are connected with international trade accounting. 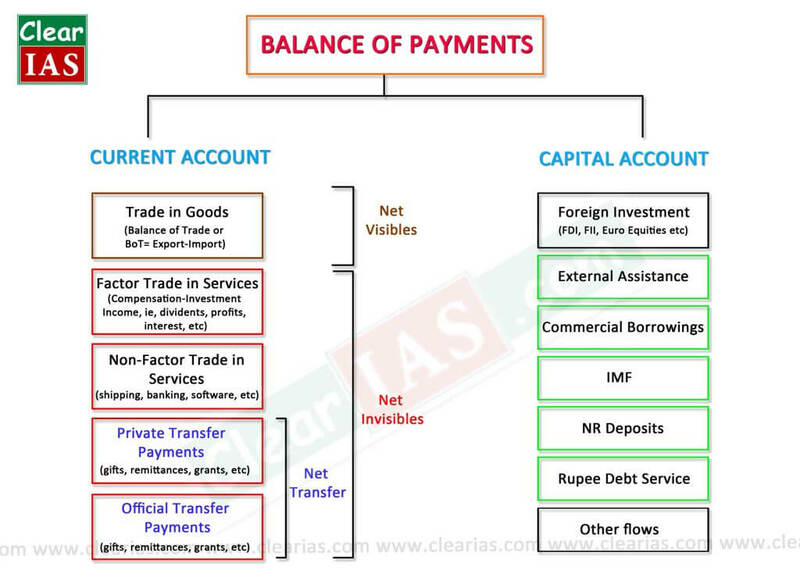 In this post, we provide a mind-map approach to study Balance of Payments. We hope the same would help in quick understanding and revision. The balance of payments (BoP) record the transactions in goods, services, and assets between residents of a country with the rest of the world for a specified time period typically a year. It represents a summation of country’s current demand and supply of the claims on foreign currencies and of foreign claims on its currency. There are two main accounts in the BoP – the current account and the capital account. Current Account: The current account records exports and imports in goods, trade in services and transfer payments. Capital Account: The capital account records all international purchases and sales of assets such as money, stocks, bonds, etc. It includes foreign investments and loans. Note: The IMF accounting standards of the BOP statement divides international transactions into three accounts: the current account, the capital account, and the financial account, where the current account should be balanced by capital account and financial account transactions. But, in countries like India, the financial account is included in the capital account itself. What would happen if a country spends more than it receives from abroad? What would happen if an individual spends more than his income? He must finance the same by some other means, right? It may be by borrowing or by selling assets. The same way, if a country has a deficit in its current account (spending more abroad than it receives from sales to the rest of the world), it must finance it by borrowing abroad or selling assets. Thus, any current account deficit is of necessity financed by a net capital inflow. A country could also engage in official reserve transactions, running down its reserves of foreign exchange, in the case of a deficit by selling foreign currency in the foreign exchange market. But, official reserve transactions are more relevant under a regime of pegged exchange rates than when exchange rates are floating. A country is said to be in balance of payments equilibrium when the sum of its current account and its non-reserve capital account equals zero so that the current account balance is financed entirely by international lending without reserve movements. Note: A BOP surplus is accompanied by an accumulation of foreign exchange reserves by the central bank. Ideally, BoP should be Zero! How? From a balance of international payments point of view, a surplus on the current account would allow a deficit to be run on the capital account. For example, surplus foreign currency can be used to fund investment in assets located overseas. Also, if a country has a current account deficit (trade deficit), it will borrow from abroad. In reality, the accounts do not exactly offset each other, because of statistical discrepancies, accounting conventions and exchange rate movements that change the recorded value of transactions. The decrease (increase) in official reserves is called the overall balance of payments deficit (surplus). The balance of payments deficit or surplus is obtained after adding the current and capital account balances. The balance of payments surplus will be considered as an addition to official reserves (reserve use). Countries with current account deficits can run into difficulties. If the deficit is large and the economy is not able to attract enough inflows of foreign investment, then their currency reserves will dwindle. There may come a point when the country needs to seek emergency borrowing from institutions such as the International Monetary Fund, that may lead to external debt. Countries with deficits in their current accounts will build up increasing debt and/or see increased foreign ownership of their assets. BoP crisis is also known as the currency crisis. International economic transactions are called autonomous when transactions are made independently of the state of the BoP (for instance due to profit motive). These items are called ‘above the line’ items in the BoP. The balance of payments is said to be in surplus (deficit) if autonomous receipts are greater (less) than autonomous payments. Accommodating transactions (termed ‘below the line’ items), on the other hand, are determined by the net consequences of the autonomous items, that is, whether the BoP is in surplus or deficit. The official reserve transactions are seen as the accommodating item in the BoP (all others being autonomous). Errors and Omissions constitute the third element in the BoP (apart from the current and capital accounts) which is the ‘balancing item’ reflecting our inability to record all international transactions accurately. The balance of Trade (BoT) or Trade Balance is a part of the Balance of Payments (BoP). BoT just includes the balance between export and import of goods. 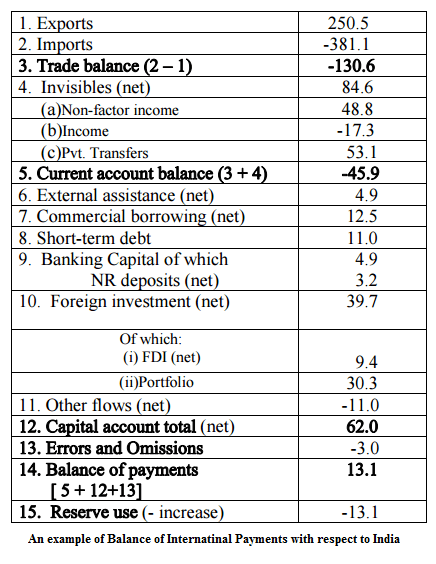 BoP not only adds the service-trade but also many other components in the current account (Eg: Transfer payments) and capital account (FDI, loans etc). Indian rupee is fully convertible only in the current account and not in the capital account. If an Indian investor earns interest or dividend in his investment abroad, that will be included in the current account of India. If FDI is done by an American company in India, that investment will be accounted in the capital account of India. NRI deposits are calculated under Capital Accounts while Private Remittances are calculated under Current Account. In general, National Income (Y) = Private Consumption Expenditure (C) + Investment (I) + Government Expenditure (G) + Net Exports (E). In a closed economy, Savings (S) = Investment (I). OR, Net Exports = Savings – Investment. This is actually the Balance of Trade (Trade Balance). 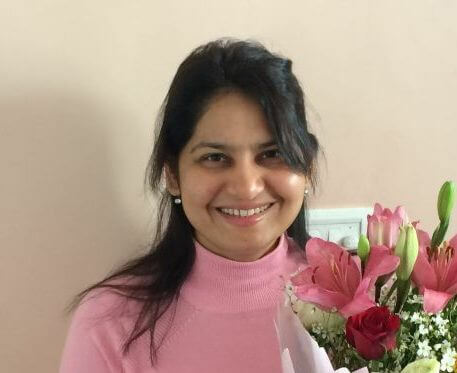 I am very thankful for your generous help to marginalized and poor students like me and millions other in India who are away from educational dividends and right guidance with authentic study materials. You are a messenger of God who is helping us to realise our dream. I can not afford regular college and for that I joined IGNOU your initiative through this website helps me to prepare for various topics. One request sir can you please publish last year’s old question bank /out dated test series it will be very helpful although I can’t join a regular test series. If you can’t then also ok, again I am very very Thankful and heavily endebt for your generous help. Thanks for the great article on BoP. Can you please send me some question bank (even out dated is ok (send it at [email protected]). I can’t join test series. Sir aapke notes hindi mein nahi aate kya? Thank you very much for your great service. Concepts are detailed at the same time easy to understand.